Philips Actionfit headphones produce crystal clear sounds with mega bass. 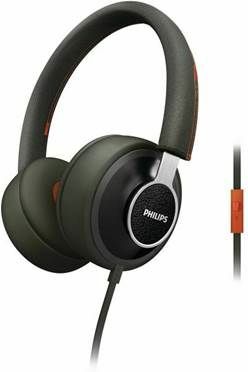 These Philips SHQ5200 headphones offer a noslip and comfortable fit. The Philips Sports SHQ5200 Headband Headphones are robust and ergonomic. Various researchers have come to a conclusion that listening to music while working out is beneficial as it keeps you away from feeling the exertion for longer and boosts you with energy. These headphones make sure you get immersive, undistorted audio for the best workout performance. They feature high caliber, 40mm drivers that deliver clear sound with a powerful bass. The soft and perfectly fitting ear cushions and nonslip headband make sure you always stay comfortable and move freely. These Philips Actionfit headphones are specially developed to help you stay relaxed and focused during your workout sessions. They feature 40mm neodynium drivers that fill up your senses with mega bass and natural sound. But they don’t completely isolate your senses so that you know what’s happening around you. With an open acoustic platform, these Philips sports headband headphones help you stay aware of your environment for safe outdoor workouts. The Philips SHQ5200 headphones never restrict your movements even during the most strenuous exercises. They have a specially designed headband with an innovative silicone grip that offers a secure fit, sans the front back pendulum effects. The ear caps of these headphones are tested to fit any ear size and shape. They are covered with a moisture wicking fabric that helps you keep sweat away from your ears for a comfortable, cool, and dry feel throughout the workout session. The ear caps can be detached for a wash after use. The headphones weigh just 99gm, which makes them ultra lightweight and comfortable to wear for hours on end.